The Department of Interactive Media and Educational Technologies (IMB) of Danube University Krems leads WP 2 (Tools and Technologies). 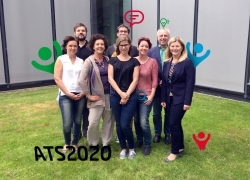 The WP2 team is responsible for the development of the tools package including environments for teaching, learning, and assessment. After having set up a basic infrastructure for the initial training work, we carry out further development of digital tools in the project according to the needs arising in the course of the project. In cooperation with the WP2 key partners, we also care for the maintenance of tools and the provision of the top level tech support. • Placing a strong focus on research and its application in teaching/learning scenarios, we are contributing to the dissemination and exploitation of the project results mainly by conference presentations/posters, workshops and communcation of our work in the framework of university teaching and expert newsletters, such as the one edited by the IMB itself (http://www.donau-uni.ac.at/de/department/imb/news/index.php). A dissemination page in German and English http://mahara.eufolio.eu/view/view.php?id=10423), showing the work of IMB of Danube University from March to December 2015, was set up in Mahara, an ePortfolio platform used in the project.